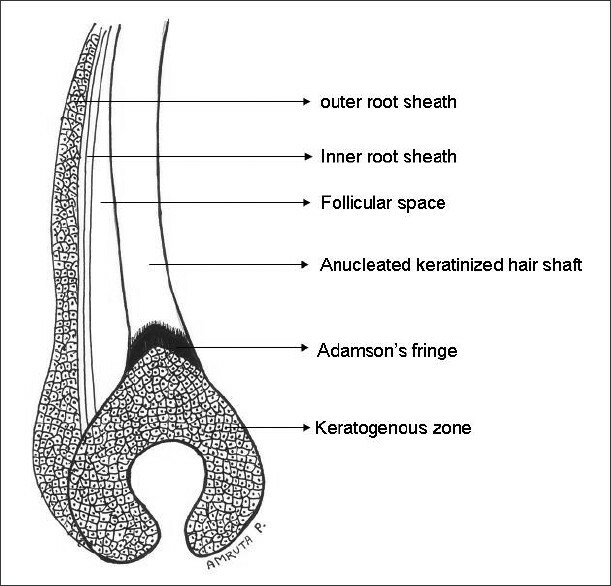 The keratogenous zone of the hair follicle is a broad area above the bulb of the follicle in which the cells are gradually transformed into hard keratin of the hair shaft. These cells maintain their nuclei, but exhibit cytoplasmic changes as they convert from nucleated to anucleated hard keratin. This zone is shaped as a high arched curve (inverted V shape) which ends at a discrete border commonly known as Adamson's fringe. This forms the boundary between nucleated cells of a hair in the bulb of a follicle and anucleated cells of a hair in the stem of a follicle  [Figure 1], [Figure 2] and [Figure 3]. 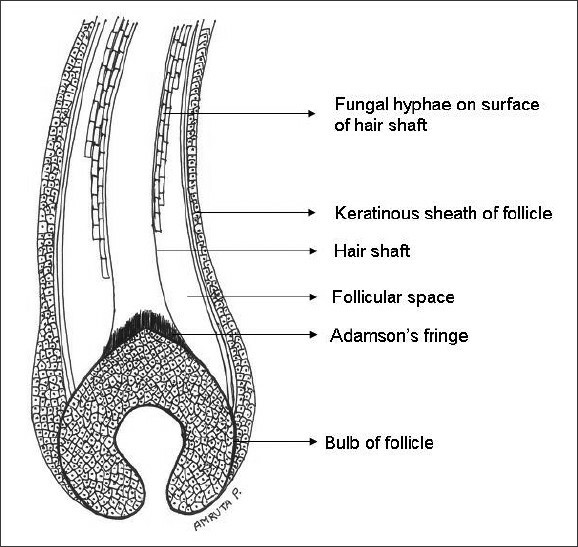 The bulb of the follicle gives rise to the stem of the follicle, which extends from Adamson's fringe to the lower part of the isthmus of the follicle. The corneocytes of the nucleated hair shaft lose their nuclei and get completely keratinized. The cuticle and Henle's layer of the inner root sheath get fully cornified with loss of their trichohyalin granules. Huxley's layer of the inner root sheath starts losing its trichohyalin granules at this level and begins to cornify, with complete cornification of it occurring midway up the stem with the formation of blue-gray compactly arranged corneocytes. Clinically this area is important as fungal (dermatophytic) infections of the hair (Tinea capitis), cannot descend below this level into the bulb of the follicle, and as Kligman showed, this is the zone where the hair shaft is penetrated by fungal hyphae. Horatio George Adamson, a distinguished dermatologist and doyen of British Dermatology was born in London on November 28, 1865. , After schooling in London, he joined St. Bartholomew's hospital in 1883 with a scholarship, and graduated as M.B of London, in 1889. Three years later he got the M.D, and was awarded the M.R.C.P in 1903 and the F.R.C.P in 1911. His initial exposure to clinical medicine was mainly in pediatrics having worked at Paddington Street Children's hospital and the North East Hospital for children till 1893 when he joined J. J. Pringle as assistant in the skin department at Middlesex hospital (Pringle had in 1890 described Adenoma Sebaceum, eponymically named after him). At Middlesex hospital under Pringle, Adamson developed interest in dermatology and in the 3 years that he spent there worked on ringworm and published several articles. His first publication was a translation of Leloir's Dermatological Neuroses and their Treatment in the British Journal of Dermatology in 1894. Three papers on studies on ringworm followed in 1895 and 1896, when he observed and described the phenomenon of dermatophytic infection of hair unable to descend below a narrow area at the upper margin of the keratogenous zone with formation of a fringe of mycelium at that level, which later was named after him and is now familiar to us as Adamson's fringe. One of these papers was read at the 3 rd International Congress of Dermatology, held in London in 1896. In his original description, , Adamson stated,  "the whole root-stem of the hair is surrounded by a sheath of closely placed small spores, extending from a short distance above the intrafollicular portion to the junction of the root stem with the soft root bulb. There is no mycelium on or in the bulb, but at the neck of the bulb, just at its junction with the root-stem, there is a fringe of mycelium surrounding the hair and projecting below the lower margin of the sheath of spores around the root-stem." Having married Mabel Draper in 1896, Adamson left London to settle down in General Practice at Guildford, in the county of Surrey, where he remained for the next 7 years. His interest in dermatology however seems to have continued as he accepted positions while still in General Practice which enabled him to see patients with dermatological diseases. He was Honorary Asst. Medical Officer at the Royal Surrey County Hospital and in 1901 joined the Broom House School for ringworm. Moving back to London in 1903, he decided to specialize in dermatology, and on the advice of Pringle was assistant to T. Colcott Fox at the Westminster Hospital. He had the greatest affection for Colcott Fox and admiration for his remarkable powers of observation and diagnosis, powers which Adamson himself developed in no small measure. In 1908 he was appointed as Radiologist for ringworm cases at the Metropolitan Asylum Board School at Sutton and this experience stimulated him to devise a modification of Kienboeck's method of X-ray epilation of scalp hair for treatment of scalp ringworm which reduced the time of treatment from 5 h to 1.5 h. This method was published in Lancet in 1909 and was used the world over. He was the Goulstonian lecturer at the Royal College of Physicians of London in 1912, his subject being 'Modern views upon the significance of skin eruptions.' In 1922-23, he was the President of the section of dermatology of the Royal Society of Medicine and in 1924 was the President of the British Association of Dermatology and Syphilology. He was a prolific writer and with his earlier experiences in pediatrics published in 1907 an excellent book on "Skin affections of childhood." In 1911, he wrote eight chapters on dermatological subjects in Allbutt and Rolleston's "System of Medicine" and on X-ray treatment of skin diseases in the Dictionary of Treatment. More than 70 other papers were published by him between 1894 and 1949, his principal interests being, skin diseases in children, ringworm, other fungal infections, Lupus vulgaris, eczemas and infections due to Staphylococcus and Streptococcus. His powers of observation were very acute and he greatly enjoyed making a diagnosis between similar seeming skin eruptions. He was very good at illustrations on the blackboard and was to his assistants and students a wonderful teacher whom they held in high esteem. To those who had the privilege of working with him he was a source of boundless knowledge and inspiration. On the occasion of his eightieth birthday in 1945, a sherry party was organized in his honor at the house of one of his former assistants, where he was presented with a silver rose bowl subscribed for by thirty of his former students, some from places as far off as Australia, South Africa and East Africa! He was a thin quiet shy man with dry humor and did not speak much, but when he did speak, his remarks were received with profound attention. After retirement he took up gardening and loved roses and although red-green blind, was a fairly good painter. His family life was trying as he and his wife had but one son who died in early life after a progressive nervous illness, which was a source of great grief and anxiety for the parents. He died on July 6, 1955, a great loss for British Dermatology. Kligman, in the early 1950s, elucidated in fine details the pathogenesis and clinico-histopathologic findings of experimentally induced Tinea capitis (M audouini and M canis), in male children and adults. The subjects were inoculated with naturally infected hair, freshly obtained from an active case. This work was supported by a grant from the US Public Health Service [E-117(C)] and was carried out in a State institution for congenitally mental defectives in Pennsylvania, where Tinea capitis was endemic and the inmates subject to constant opportunity for infection. In Kligman's words, "The experimental circumstances were ideal in that a large number of individuals living under confined circumstances could be inoculated at will and the course of the disease minutely studied from its very onset. Biopsy material was freely available. By contrast, Sabouraud's researches were largely limited to the clinical opportunities presented by ringworm patients appearing at his Paris clinic". All earlier work on Tinea capitis was based on epilated hair, and this was the first instance of detailed histopathologic study and confirmation of events occurring within the hair follicle in the course of its infection by dermatophytes, and Kligmans observations validated the presence of Adamson's fringe and described its pathogenesis. As the subjects had been infected with spores, presence of hyphae indicated the germination of spores and colonization of the follicle. Kligman observed that by 3-4 days after inoculation, a substantial mass of segmented hyphae accumulated in the upper follicular canal, a finding that Sabouraud had earlier termed as "mycotic cone." In contrast to the accepted view that the fungus grows downward in the follicle within the keratinous lining of the follicular wall, leaving the straum corneum to invade the hair shaft half way down the follicle, Kligman's histological findings indicated that fungi, instead, grow downward on the surface of the hair shaft without invading either the shaft itself or the surrounding keratinized lining of the follicle. He said, "the hyphae, though possessed of keratolytic enzymes, take the easiest path downwards by attaching to the hair shaft and progress along its surface downwards. The fungus does not attack the band of keratinized inner root sheath at any stage but in its downward progression on the hair surface, displaces and deforms the keratinized band of the IRS, causing it to desquamate prematurely." This initial phase was termed as Follicular phase of infection wherein the fungal spores enter the follicle, germinate and form extrapilar hyphae that entwine around the hair forming parallel chains along its long axis [Figure 4]. As long as the hyphae remain external to the hair they are present as large rectangular arthospores (primary spore formation). The smaller ectothrix spores characteristic of microsporum species are formed later when the hair is actually invaded by the fungus (secondary spore formation). At all stages of microsporum infections, the hyphae outside the hair tend to fragment and form spores, whereas intrapilary hyphae form long filaments with only occasional septation. The second phase was termed the Pilar phase [Figure 5] and [Figure 6] which did not occur till 6 to 7 days after inoculation and was associated with fluorescence under Woods light. Fluorescence does not occur before hair penetration and is confined to that part of the hair which is actually invaded, because the fungal cell itself and the mass of ectothrix spores produced subsequently, do not fluoresce. The hyphae penetrate under the cuticle, proliferate downward in the subcuticular cortex, and reach the terminal portion of the keratinized hair by 9-10 days after inoculation. The downward growth of the intrapilary hyphae is abruptly terminated at the upper limit of the keratogenous zone which has an inverted V shape. The hyphal tips at Adamson's fringe never penetrate into the nucleated cells and because the fungus is so sharply limited to the precise upper limit of the keratogenous zone, Kligman postulated that a biochemical substance produced by the cornifying cells may function as an inhibitor of the fungus. Kligman said, "there is a unique dynamic relationship between host and parasite at Adamson's fringe and a clear line of battle is formed here with a splendid equilibrium wherein although the fungus cannot penetrate any further, must, for the infection to be maintained, be able to grow as rapidly as the keratin that it infects is being formed, or else the fungus would gradually be passively pushed out of the follicle by the continued growth of the hair." The infection in a given hair is maintained by the proliferating hyphae of Adamson's fringe. 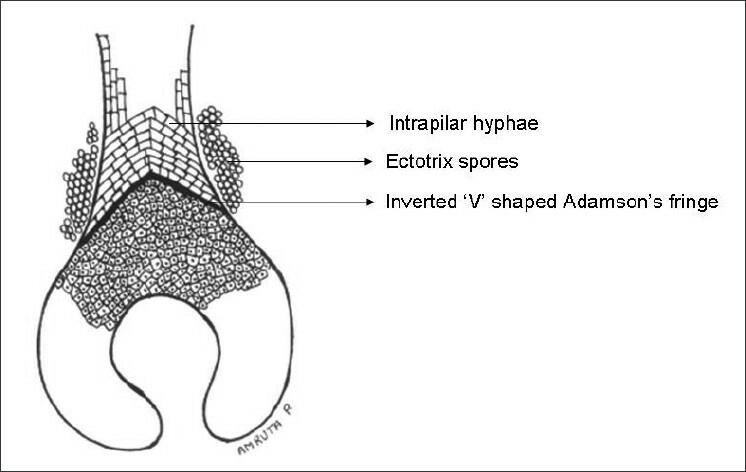 Adamson believed that the terminal radicles of the fungi were external to the hair; however, Kligman countered that in actuality, the fringe is intrapilary, and once it is formed primary spore formation ceases and ectothrix spores characteristic of microsporum infections are produced. The tips of these hyphae invade the keratin as it is formed and thus during the active phase of the infection the growth rate of the fungus and hair are exactly equal (0.35-0.4 mm/day) and as long as the fungus keeps growing at this rate there is host--parasite equilibrium, which in M audouini may last for years. The invasion of the hair shaft is marked by development of fluorescence which on plucking the infected hair is initially seen as a narrow but bright band 0.75-1 mm broad and located about 1 mm above the bulb near the basal portion of the hair root and corresponds to the site of Adamson's fringe. This band gradually lengthens upward along the hair at a rate of about 0.3 - 0.4 mm/day, till the fluorescence becomes visible at the mouth of the follicle indicating complete infection of the hair shaft. The lower most portion of the fluorescent band, however, remains from the beginning at a more or less fixed level in relation to the follicular bulb. The new keratin that is being formed just above the keratogenous zone becomes fluorescent as rapidly as it is being formed indicating that the fungus invades the new keratin at the same rate as the growth of keratin and that Adamson's fringe is the only site where the fungus invades the hair shaft and all subsequent spread is intrapilary. 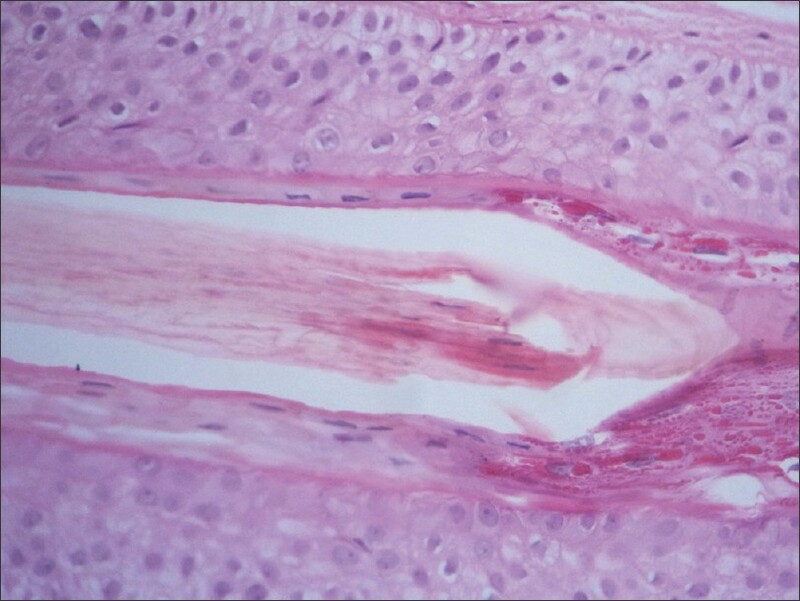 2 - 4 days after inoculation: There was no clinically evident disease; however, histopathology showed hyphae in the stratum corneum of the epidermis and follicular orifice with downward growth of fungal hyphae along the hair surface with formation of chains of cells on the surface of the hair (primary spore formation) without hair invasion. 4 days to 4 months: Clinically typical pattern of ringworm was seen, infected hair showed fluorescence at the base and at 3 weeks break off few mm above the scalp surface. 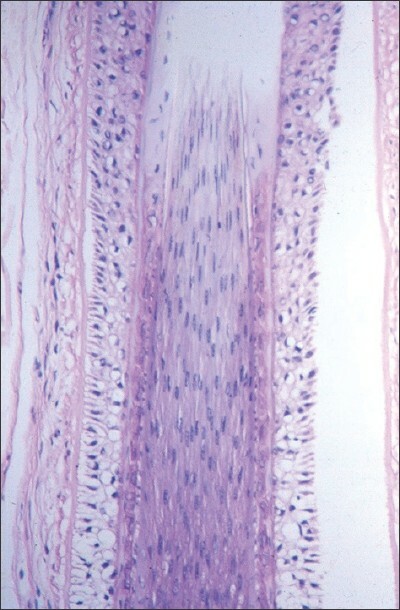 Histology shows that intrafollicular hyphae penetrate hair 6--7 days after inoculation and descend to exact upper limit of keratogenous zone and form Adamson's fringe (12th day), and the external branches of the intrapilary hyphae segment into short chains of ectothrix spores. 4 months to several years (refractory period): No new lesions develop, the clinical appearance is constant, there is host--parasite equilibrium and under the microscope no hyphae are present in the stratum corneum of the epidermis; however, intrapilary hyphae are present with copious numbers of ectothrix spores, and the patient is infective to others. Period of involution: Individual hairs show diminished fluorescence, hair become longer, and break less readily. The formation of ectothrix spores gradually decreases and quantities of intrapilary hyphae progressively decline and at some stage the host clears off the infection. Tinea capitis is no longer a major public health problem as it was in the early and mid 20 th century and Adamson's fringe is today better known as an anatomical landmark in the hair follicle, however, as originally described by Adamson, it referred to the mass of fungal hyphae that developed at the upper margin of the keratogenous zone of an infected hair follicle and hung suspended like a fringe surrounding the hair, projecting below the lower margin of the spores surrounding the hair shaft. 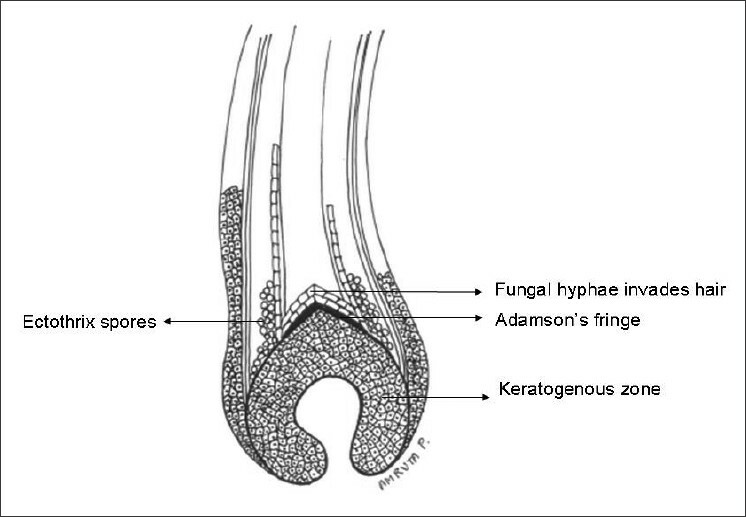 Kligman demonstrated that invasion of hair by fungal hyphae occurred in a very narrow zone which corresponds to Adamson's fringe and not in the rest of the keratinized hair shaft or in the nucleated bulb of the follicle. It is known that telogen (club) hair do not get infected by fungus as they do not provide a suitable substrate and it is likely that only newly formed keratin is suitable for fungal growth and as this is available only at the outer margin of the keratogenous zone, fungal invasion of hair occurs precisely at this spot and the fungal growth equals the rate of new keratin being formed at Adamson's fringe. As long as the fungus maintains the same rate of growth as that of the hair shaft the infection persists. Histopathologic findings from Kligman's study refuted Sabouraud's widely accepted view that the fungal hyphae follow a continuous keratinized pathway (the keratinous ring surrounding the hair shaft made up of the inner root sheath and outer root sheath in the stem and isthmus and stratum corneum in the infundibulum) from the surface halfway down the follicle at which level they leave the stratum corneum and enter the hair. Kligman, however, did not explain how the fungi enter the follicular space, i.e. the potential space between the cuticles of the hair shaft and the inner root sheath, as these two structures are tightly adherent to one another and move upward together as the hair shaft grows outwards. Kligman's monumental work was supported by a grant from the US Public Health Service and received wide acclaim in those days, but in our world today is entirely unconceivable, involving as it did, experimentation on mentally challenged, institutionalized human beings. The diagrams were drawn by Ms. Amruta Pathare, M. Sc. 1. Ackerman AB, Chongchitnant N, Sanchez J, Guo Y, Benin B, Reichal M,et al. In Histologic diagnosis of inflammatory skin diseases: An algorithmic method based on pattern analysis. 2 nd Ed, Philadelphia: Williams and Wilkins; 1997. p. 34-5. 2. Steffan C. The man behind the eponym: Horatio George Adamson and Adamson's Fringe. Am J Dermatopathol 2001;23:485-8. 3. Adamson HG. Obituary. Br Med J 1955;2:206-7. 4. Adamson HG. Observations on the parasites of ringworm. Br J Dermatol 1895;7:201-11. 5. Adamson HG. Observations on the parasites of ringworm. Br J Dermatol 1895;7:237-44. 6. Kligman AM. The Pathogenesis of Tinea capitis due to Microsporum audouini and Microsporum canis: I, gross observations following the inoculation of humans. J Invest Dermatol 1952;18:231-45. 7. Kligman AM. Tinea capitis due to Microsporum audouini and Microsporum canis: II, dynamics of host-parasite relationship. Arch Dermatol 1955;71:313-37.